It's a January 1 tradition with us: get up early (yes, early), head out to a targeted spot and find as many birds as possible to start off a brand new year list. This time around, we started the search in Warren County, since Ivan anticipated that foraging snow buntings would be easily visible on some of the farm fields near Carpentersville. The snow cover presumably would force the flock to concentrate toward the cleared edges of the road rather than spreading out over a broad expanse of farm fields. Plus, we could also stop by Round Valley, Spruce Run and Merrill Creek for waterfowl and various wintering songbirds. Somewhere in the mix, there'd be something else of note; I didn't know what, but I was confident. The farms offered a bit of a mixed bag. While we found a big flock of horned larks near the side of the road and snow geese overhead, buntings were frustratingly absent, and nary a kestrel was patrolling the fields. Chalking the results up to the unpredictability of nature, we went on our way, with a detour to grab some coffee and fill the tank. We've been to the area plenty of times, but it was the first time we've stopped in the small commercial area of Alpha, so I had an eye out for the new and unusual. The roadside didn't disappoint. Not far away from the Quick Chek, we passed a large stone slab, about seven feet tall, standing proudly at a street corner. It looked kind of dampish in places, the way concrete tends to when there's been precipitation recently, but I could make out some lettering beneath a relief sculpture and the legend "Safety Follows Wisdom." Bingo! We pulled over and I jumped out to investigate. Closer inspection revealed that the marker was an award recognizing Vulcanite Portland Cement Company for a perfect worker safety record in 1930. Only thing was, the Vulcanite Company was nowhere to be seen. Had the award outlived the business? And what was the origin of the award? We'd found a nice little research project. We already knew that Warren County was a good location for cement companies, due to the availability of good quality lime, a core component of the building product. You'll recall that Thomas Edison's Portland Cement plant operated in nearby New Village, and there's a big cluster of lime kilns in the area, too. Large open-pit quarries reached the mineral easily and inexpensively, making the industry a natural for the location. Edison, in fact, was so high on the potential of cement that he envisioned entire communities of concrete houses built cheaply for working class families. 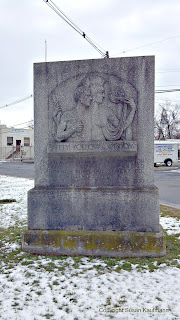 His company and Vulcanite were the two major cement manufacturers in New Jersey. The big cement slab of Alpha is anchored in the early days of the worker safety movement. Starting in 1912 and well before the enactment of the Occupational Health and Safety Act, the Portland Cement Manufacturing Association began tracking on-the-job accidents and fatalities within its members' plants. This led to the creation of programs to encourage worker safety, and eventually to the establishment of an industry award for the plant with the best record in a given year. For the first several years of the program, winning plants received a trophy to be held until the next awardee was announced, but presumably this wasn't enough to publicly represent the industry's commitment. Something bigger, more permanent could be placed outside the plant gate to remind workers of their achievement and prompt them to keep the safety culture going. The association held a competition for the design of a larger, more permanent and more public monument to be displayed by plants that operated accident-free for a full year. Fittingly, it was to be cast in concrete, with room to recognize subsequent achievements. The winning design was created by a group of students from the Art Institute of Chicago, with guidance from noted sculptor Albin Polasek. The character on the right is meant to represent Athena, goddess of wisdom, with a lamp to illuminate the path forward for the male figure personifying safety. The first such monument was awarded in 1924, with the last presented sometime in the 1980s when it was deemed too expensive to hand out seven-foot tall concrete slabs on an annual basis. Google search reveals dozens of nearly identical monuments all around the country, in many places abandoned with the shells of the factories whose employees earned them. The Portland Cement Association still recognizes excellence in safety, but with a much smaller token of esteem. The Vulcanite company opened in 1894 and appears to have ceased operation in 1941, leaving its monument behind. This would be consistent with the fate of the Edison Portland Cement Company, which closed in 1937 and was dismantled in 1942, a victim of resource shortage. The area's more accessible limestone deposits were being rapidly depleted, leaving only underground deposits that would require expensive shaft mining to extract. Today, New Jersey has no cement manufacturers, but the work of countless plant workers is memorialized in the durability of the structures cast from their product... and the trophy that stands as testament to their commitment to safety.